We asked one of the brothers who run the company, Jimmy, to write a blog about Puremeso – our made from scratch softer than the softest fabric. There’s a lot to say about it, but let’s first start at the beginning. Before The Normal Brand, there was Normal Shirt, and Normal Shirts wasn’t a company, it was literally what I called the shirt I wanted. I called Linda, a lifelong friend who is basically our sister, in LA and said I wanted some Normal shirts. After some conversations and some arguments (we argue a lot – Linda is now our Director of Product Development – fancy), we decided Normal shirts had to fit our Normal lifestyle. They had to be well suited to be worn from the city to the country and everywhere in between. They had to be comfortable, durable, and versatile. We couldn’t find anything that was out there. So we decided to make them. And the first thing out of the box was Puremeso. Well first of all – it’s a word we made up. It’s pronounced PURE-MASE-OH. Our dad still sometimes calls it PUR-MESSO, which is really tough. PURE-MASE-OH. Why did we name it Puremeso? 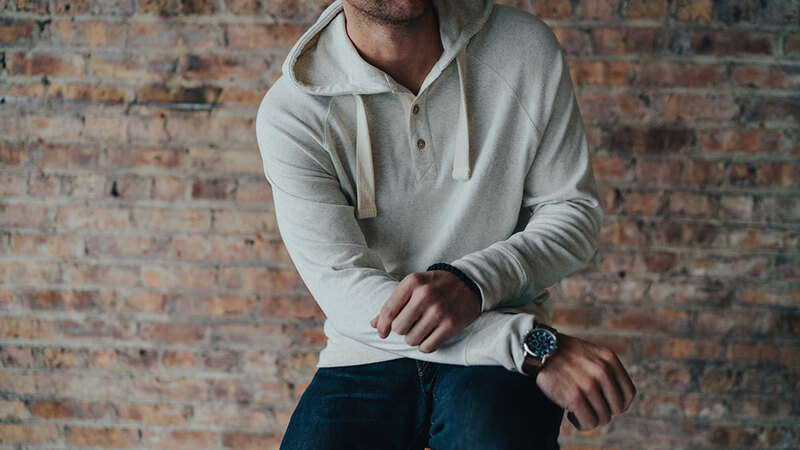 People kept asking us what this almost unbelievably soft fabric is, and it was exhausting getting into the fiber content and after cut and sew treatment each time (it’s a ribbed cotton + poly + stretch + amazing washes) so we knew we needed a name. And after paying an attorney to protect a name like “Normal Brand,” we decided it would be best to pick a word that no one has ever tried to protect (side note – being an IP Attorney seems like an incredibly lucrative profession for anyone job hunting). We wanted the word to sound soft. We wanted to not go broke. From the beginning, Puremeso has been an absolute crowd pleaser (it’s even won awards!) and has influenced the rest of our collection (all wovens are washed down to feel soft and broken in and same with T-shirts). This Fall, we really worked on the fit. We heard from you guys and you wanted a little bit more ease through the waist, which we provided. These shirts fit true to size now. Additionally, we added more colors, styles, and weights. You wanted a Puremeso Hoodie in a heavier weight and now you’re getting one. It will be available online in October. We are really pumped and proud of how these styles came together and can’t wait for you to get your hands on them.